After teasing U.S. audiences with two concerts last November upon the release of their first studio album in 14 years, it appears that Jeff Lynne’s ELO is about to announce a more elaborate U.S. tour. On Monday (February 1st) night, Lynne teased on Facebook and Twitter, an image of the familiar ELO spaceship with the words “Landing Soon Los Angeles.” We’re not rocket scientists but we think it’s safe to say that an announcement of a Jeff Lynne’s ELO 2016 U.S. tour is imminent and that it will commence on the west coast. Our guess? Based on the band’s U.K. and European dates this spring (see below), the ELO ship will land on U.S. shores this summer. The re-tooled Electric Light Orchestra has played a handful of dates over the past 18 months. A huge comeback event before 50,000 in London’s Hyde Park in September 2014 gave Lynne the confidence that the public interest was not only there, it was insatiable. He recorded Alone In The Universe and signed a worldwide deal with Columbia Records. 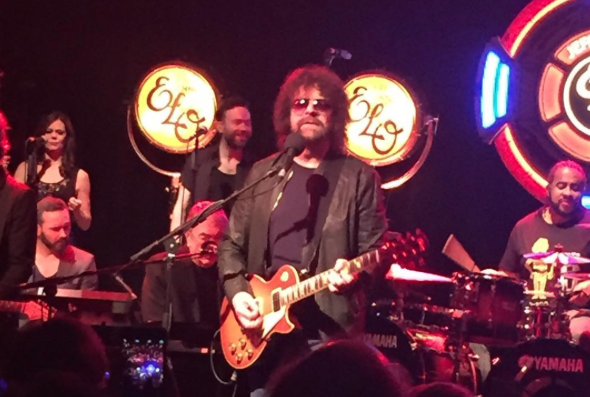 Under the moniker Jeff Lynne’s ELO, the album was released on November 13, 2015 and the band did an intimate show at London’s Porchester Hall on November 9th. Club dates in New York (November 20th) and Los Angeles (November 24th) with the 12-piece orchestra followed while Lynne did tons of press and TV appearances.